"Flatbreads topped with chicken breast, mushrooms, and Alfredo sauce. Prepare ahead by thawing bread dough in the refrigerator overnight. This recipe was made in a Panasonic CIO." Marinate chicken breast in Italian dressing for 10 minutes. Slice chicken thinly across the grain into pieces the width of thick bacon. Cut bread dough into 2 equal pieces. Roll dough into 9-inch circles. Spread Alfredo sauce evenly over dough. Cover with a little mozzarella cheese. Add chicken, mushrooms, and bacon. Sprinkle remaining mozzarella cheese on top. Place 1 pizza in the Panasonic Countertop Induction Oven and press "Auto Cook." Select the frozen pizza setting, 9-inch size. Allow pizza to cook until timer goes off, about 13 minutes. Repeat with second pizza. This turned out great! I'm vegetarian so I made it without the meat but I would definitely make this again. Editing to add that I've now made this pizza 3 times because we love it so much! OMGOODNESS....I love yr page Cliff !!! 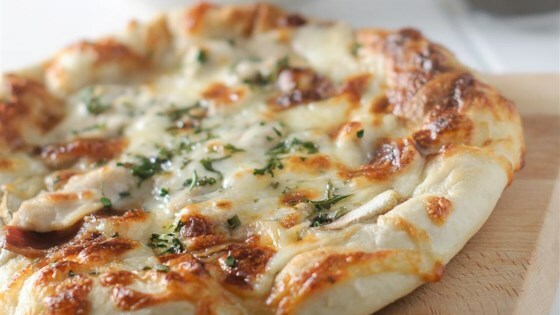 I can't wait to try out yr Chicken Alfredo Flat bread pizza... Wish me luck....Thx from South GA !!! Followed recipe and we loved it! So many different combo`s to be made with this recipe!